Given the choice, I would choose to use the Nik Collection in Photoshop every time. In this article I’m going to explain why and give you some tips about how to get more out of the Nik plugins in Photoshop. If you want to see more Nik Collection tutorials and videos, visit the Lenscraft Nik Collection Tutorials page. We’ve covered a lot of ground in this article and some of these features can be confusing. To help you better understand everything we’ve covered, I’ve published a video on YouTube explaining how you can use the Nik Collection in Photoshop. It explains all the features we’ve discussed in this article and demonstrates how to use them. You can watch the video below or on YouTube directly. If you haven't done so already, why not subscribe to my YouTube channel. I publishe a new and informative video each week. In Photoshop you have two options for launching the Nik Collection plugins. The first is to use Photoshop’s Filter menu and the other is to use the Nik Selective Tool. To open a Nik plugin from the Filter menu, click on Filter. At the bottom of the menu you will see the Nik Collection. Here you can select any of the plug-ins in the Nik Collection. When you click one, it will launch that plug-in, loading the current image you are editing. Depending on the versions of the Nik Collection and Photoshop that you’re using, you may find Photoshop crashes when you try this. This is a recent bug that’s developed when using the old Google Nik Collection with the latest versions of Photoshop. If you find this happening to you, one solution is to upgrade to the new Nik Collection 2018 by DxO. Alternatively, you can try the next option for launching the Nik Collection plug-ins, which appears to resolve the problem for most people. Our other option to launch the Nik Collection in Photoshop is to use the Nik Selective Tool. This is the floating window that appears in Photoshop and lists each of the plug-ins in the Nik Collection. You can see this illustrated below. To launch one of the plug-ins from the Nik Selective tool, just click that plug-in on the list. If you can’t see the Nik Selective Tool in your version of Photoshop, you can open it from the Photoshop File menu. To do this select File and then Automate from the menu. Under the Automate menu item you will find the Nik Selective Tool. Click this to open the tool. 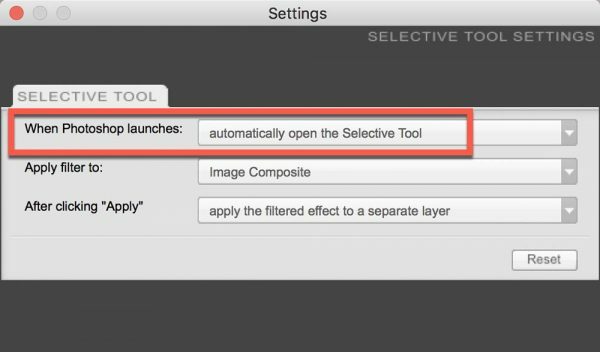 To open the Selective Tool automatically when you launch Photoshop, click the Settings icon at the bottom left of the tool. In the dialog you can set the tool to open automatically open each time you open Photoshop. You can see this in the screenshot below. One of the best features of Photoshop is its support for layers. This allows you to place your adjustments made using the Nik plug-ins onto an entirely new layer. When you do this, you’re using non-destructive editing. Layers also help you to use other Photoshop features like Blending Modes, Layer Opacity settings, and Layer Masks. These are all very powerful features of Photoshop and a good reason to use Photoshop as your host application for the Nik Collection. But it doesn’t stop there, the Nik Selective Tool can help you to use these. A great feature is that you can configure it to automatically create a new layer each time you launch a plug-in. The plugin then applies its adjustments to the new layer. 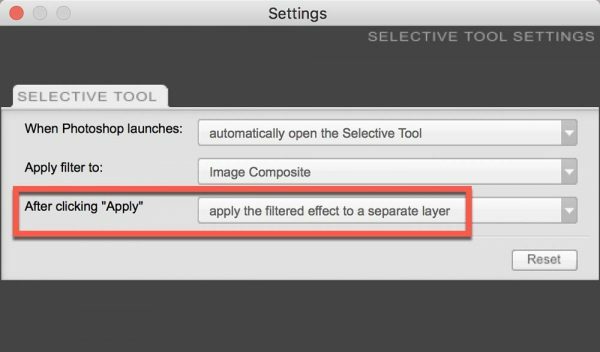 To configure the Nik Selective Tool to create new layers, click on the Settings link at the bottom left of the tool. When the dialog opens you will see the bottom option is to create a new layer to apply adjustments to. You can see this below. Select this option and then click OK to close the dialog. Now when you launch a plug-in from the Nik Selective Tool any adjustments are applied to a new layer. Sometimes you find that the new layer becomes consolidated or flattened when you exit the plug-in. This sometimes happen even when you’ve configured the Nik Selective Tool to apply changes to a new layer. If you find this is happening, it could be that the plug-in has a different configuration and is conflicting with the tool. You can change this by opening the plug-in and clicking the Settings button to the bottom left of the interface. This will display the Settings dialog as shown below. Here you will find the option to apply the filter effect to a separate (or new) layer. Select this option and click the OK button to close the dialog, saving your change. Now when you launch this filter from the Nik Selective Tool, the changes are applied to a new layer. Remember, each of the Nik Collection filters is a separate application. You will need to change this setting in each one individually. One very useful feature in Photoshop is the ability to use Smart Objects and Smart filters. A Smart Object is a specially converted layer and appears in the Photoshop Layers Window. When you apply a Nik Collection filter to a Smart Object, Photoshop recognises it as a Smart Filter. This means any adjustments you apply using the filter stored in the smart object. 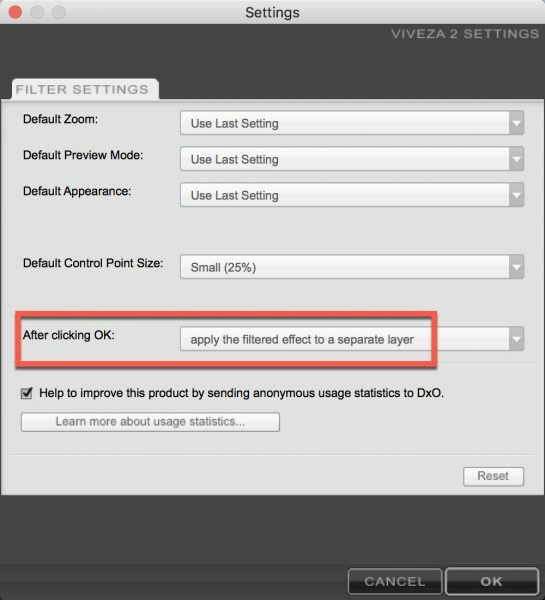 The benefit of this is that next time you open your Smart Filter, it displays the adjustment you previous applied. This includes any control points you may have added. 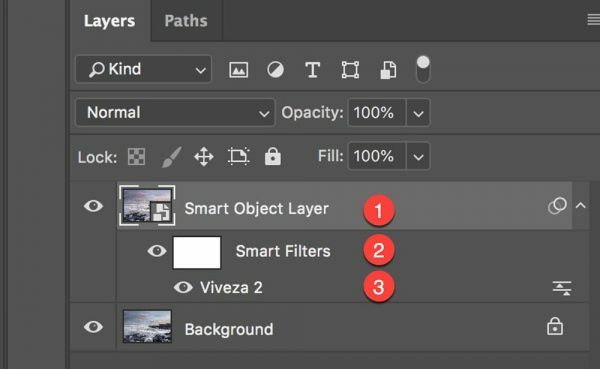 Providing you save your image in the Photoshop format, you can still open and adjust Smart Filters you added in the past. To create a Smart Object, duplicate a layer in the Photoshop Layers Window. With the new layer selected, click the Photoshop Filter menu. At the top of this menu, you will find the option “Convert for Smart Filters”. When you select this, Photoshop will convert the layer and you will see its thumbnail changes in the Layers Window. Now when you select the Smart Object and launch a Nik Collection filter, you may see a warning message as shown below. This is telling you that the layer you’re editing is a Smart Object. Continue past this by clicking the OK button. You can now apply your adjustments with the Nik filter as you would normally. Once you have finished, click the OK button to save your changes and return to Photoshop. If you look in the Photoshop Layers Window you will now see the Smart Object layer (1), a Smart Filters mask (2), and the Smart Filter you just added (3). You can re-open a Smart Filter by double clicking it in the Photoshop Layers Window. You should then see your last adjustments, together with any control points you added, are saved. The video on this page is part of my Bitesize Nik Tutorials series that I publish on my YouTube channel. I publish a new video each week and to be sure you don’t miss any you can subscribe to my channel using this link. I hope you enjoyed the article and video. 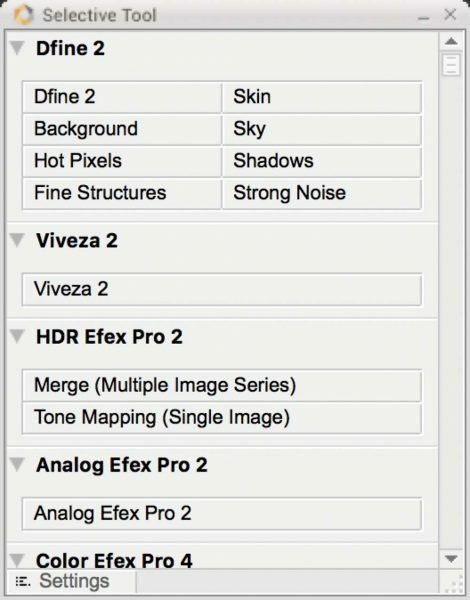 In case you’re using Lightroom I also created this article explaining how to use the Nik Collection in Lightroom. Did you know that you can also use the Nik Collection with Affinity Photo.